The Second Assessment provides a comprehensive overview of the status of transboundary waters in the European and Asian parts of the UNECE region, covering more than 140 transboundary rivers, 25 transboundary lakes, about 200 transboundary groundwaters and 25 Ramsar Sites or other wetlands of transboundary importance. It has been carried out under the auspices of the Meeting of the Parties to the Convention on the Protection and Use of Transboundary Watercourses and International Lakes (Water Convention), in close cooperation with water and/or environment administrations of some 50 countries and with involvement of more than 250 experts. 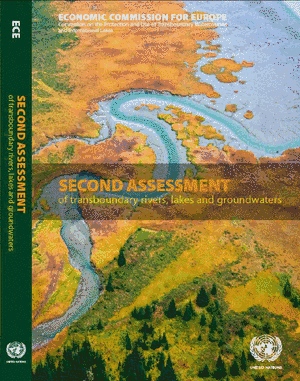 Utilizing data and information provided by national Governments and river commissions, maps, graphs and statistical data, the Second Assessment presents a broad analysis of transboundary water resources, pressure factors, quantity and quality status, and transboundary impacts, as well as responses and future trends. It also documents national and transboundary legal and institutional frameworks for water management and cooperation. The Second Assessment seeks to provide a picture of the expected impacts on transboundary water resources, including the measures planned or in place to adapt to climate change. Partners in the preparation of the Second Assessment include the Finnish Environment Institute, International Water Assessment Centre hosted by the Slovak Hydrometeorological Institute, UNEP/DEWA/GRID-Geneva, International Groundwater Resources Assessment Centre and Zoï Environment Network. The Second Assessment was supported by the Governments of Finland, Switzerland, Sweden, Germany, Hungary, Netherlands and Georgia.